Let’s say your site is doing just fine in the rankings and suddenly you notice a drop. It could be a drop in just the ranking position or the amount of organic, local, or any subdivision traffic. You’ll have to move quick to plug up that hole before it gets bigger, and doing SEO diagnostics is the first start. The first thing you look for is performance of your site. See how the load times have been. Some hosting companies might slack off or you may have added some content or configuration that has caused your site to slow down. You need to get in there and correct it. Next is to look for upgrading and updating of content. Has your content become old and uninteresting? Are you focusing on the latest information regarding your business niche? If people are looking for the new ABC Fishing Lure and you’ve only got the 123 Fishing Lure on your website, then the traffic and relativity will drop and you’ll lose position regarding interest in your site and this will reflect on your rankings. Get in there and add new content and do it wit professionalism. Don’t hire hacks. Get quality content creators and add the right keywords, keyphrases, and keygroups that are relevant to your niche. Bad reputation. Are you getting talked about behind your back? What are customers saying about your site? Are there reviews about your site that are less than encouraging? You’ll have to do some searching here and address any and all negative comments about you and your site. Social media sites may be the culprit too and they can be daunting as they’re so huge. If you find a negative comment then address it with a friendly response, not hostility, it will show you to be the better person and make surfers more likely to visit your site for clarity. Worse case scenario is that Google has penalized you. If so, there are measures to take that range from simple to very complex. Google’s new RankBrain technology has AI that is growing in complexity and perhaps will be able to correct sites penalized unfairly, but until then, you’ll have to do your own work. Keyword collapse. Keywords are important but how they’re applied is far more important. You have two problems with keywords, one being competition and the other being misuse. In the old days webmasters would employ ‘keyword stuffing’, a practice where they would take a word and put it all over their websites just to get the attention of the search engines. That practice will get you penalized and penalized hard nowadays. Your keywords have to be relevant to your niche and be placed in a natural flowing sentences. These keywords grow into keyphrases and then keygroups. You may have to do more in-depth keyword research and that can be a chore, but it is essential in a situation like this. Finally, are you getting backlinks that are outdated or harmful? Websites sometimes die off or change content or are purchased by criminals. If these sites are linking to yours, it’s not a good thing. You could be getting penalized or blocked because of your association with these sites. Do your due diligence and clean those links up. Also, don’t forget your links out as well. If you’re linking to a disreputable or non relevant site, you could be doing yourself grave harm. 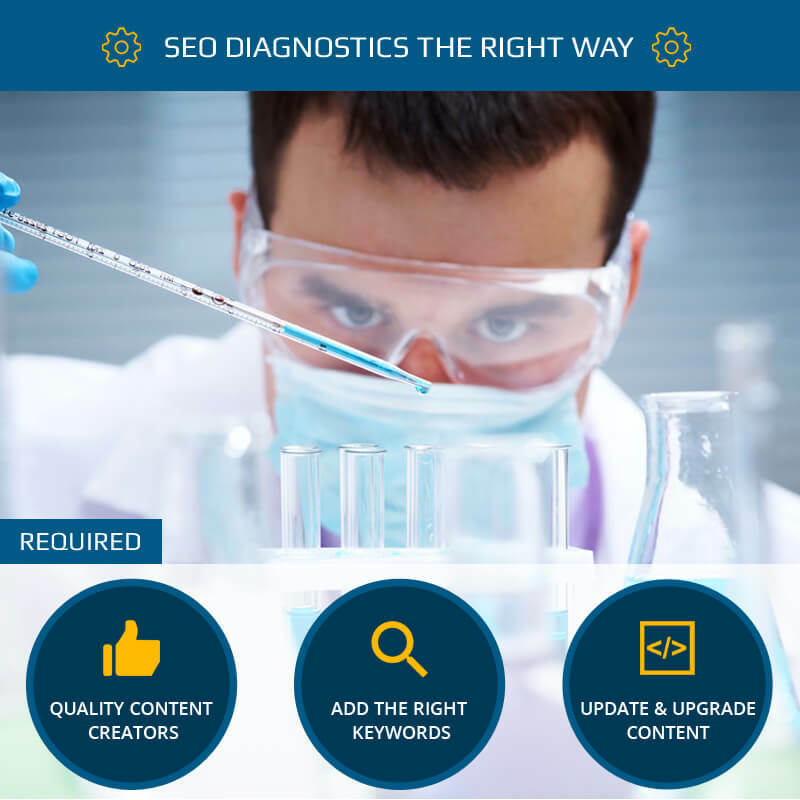 Overall, it may be a simple task or a deep dish rehash of your entire website, but doing SEO diagnostics the right way is both preventative and remedial medicine a healthy business needs. If you have a business website and are considering whether you need the local SEO optimization service please contact Local SEO Tampa Company office at 727-938-8891. We will be able to speak with, or meet with you directly, to discuss web marketing and local SEO optimization questions.